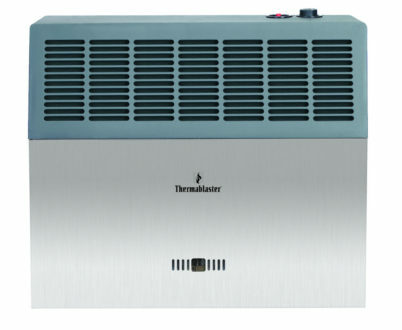 The Thermablaster 18,000 BTU Direct Vent Wall Heater vents through any outside wall (up to 10 inches thick). This direct vent heater uses outside air for combustion and the burnt gases are then vented outside. Our direct vent heater burns with 80% efficiency, so you get excellent value for your fuel dollar. Each Thermablaster gas wall heater INCLUDES the vent kit, so the only thing you need to do is cut a round hole through the wall, install the vent kit, and hook up a gas line. No special insulation or fire-proofing is required for the vent kit. This heater uses a dual-wall pipe that exhausts the hot gases through the center pipe while bringing in cooler outside air through the outside pipe. This heater has an enclosed blue flame for maximum safety while a second stainless steel front panel adds to the high end appeal of the unit. We recommend using a ceiling fan or air vents for maximum air circulation. A certified technician is required for installation. The warranty is void if the heater is not professionally installed.